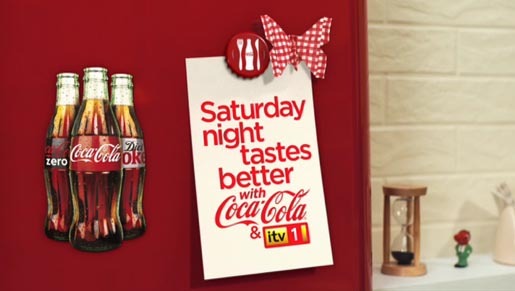 Coca-Cola Great Britain is collaborating with ITV1 in a new advertising campaign, communicating that ‘Saturday Night Tastes Better with Coca-Cola and ITV1’. A new television commercial uses stop-frame animation to create enchanting scenes of family togetherness, with a family’s mealtime transformed thanks to the Coca-Cola portfolio. As they open and share the refreshing drinks, they ‘Open Happiness’ and a vibrant scene unfolds before their eyes as Mother Nature sprinkles magic on their kitchen. Cue the arrival of colourful butterflies, friendly garden gnomes, green grass and fresh daisies to make-over their mealtime. High impact outdoor six sheets use heart-warming imagery to highlight the brands as being central to happy family occasions and spread the message that ‘Meals Taste Better With Coca-Cola’. Hitting the airwaves, the brand will be reaching out to its target audience of mums with a series of radio promotions airing on Saturday nights. The Saturday Night campaign was developed at McCann Erickson London by art director Jay Philips, copywriter Neil Clarke, and agency producer Chris Chapman. Filming was shot by director Conkerco (Chris Rule and Ben White) via Academy Films, London. Post production was done at Golden Square.